Susan's One Layer Challenge this week is to use ribbon. She said only one piece of ribbon; I said "these ribbons are so skinny, I need to use 3 of them"!! 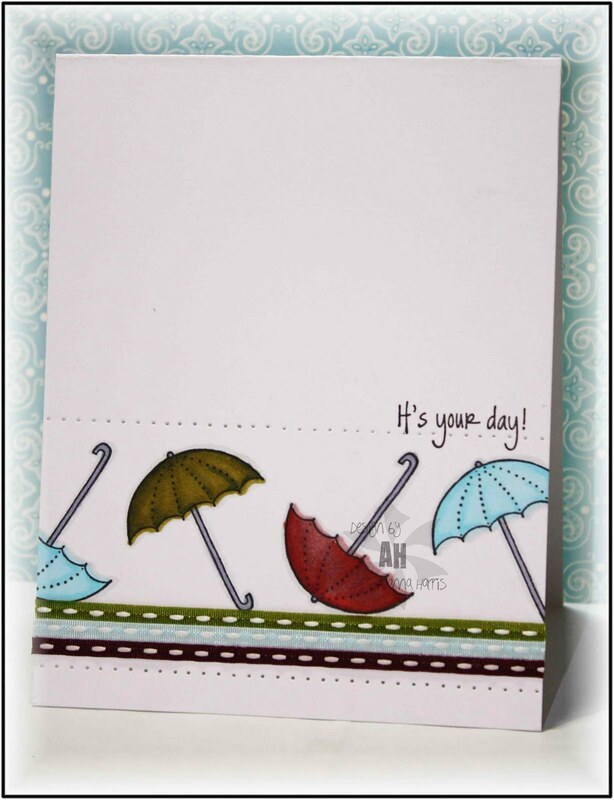 It's a rainy, miserable day today, so umbrellas were the perfect stamp to reach for for this card. 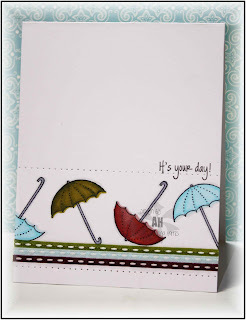 I stamped the umbrellas using my SAMJ, grounded them with 3 ribbons, added some piercing and a sentiment. For the sake of simplicity, I resisted the urge to add some raindrops. Hope you like it...and hope you try out Susan's latest challenge. What a great design! I love the umbrellas. Of course you had to use three, and they are perfect! Love the piercing, too! We also had a rainy day. Your umbrellas look so happy! This is a great card! Love the piercing and the way the umbrellas are stamped off the edges. Love the design, love the colours, wonderful card! Super design! I'm awed..those umbrellas are magnificent! What a great CAS card! I love your trio of skinny ribbons, a fab look! I love this card! Those umbrellas are great. I couldn't live without my SAMJ. Just love your style ! Love the 3 ribbons... they rock! Great card! Love the little umbrellas...and the piercing is the perfect finishing touch! Love your card! The umbrellas are perfect and the piercing and ribbons pull it all together! Lovin' the ribbons almost as much as the umbrellas! Great card! It's never going to stop raining here. I should put up my paper and glue and get out my boat building tools! Fabulous card ... it really stood out in the OLC gallery! I'm lovin those umbrellas!